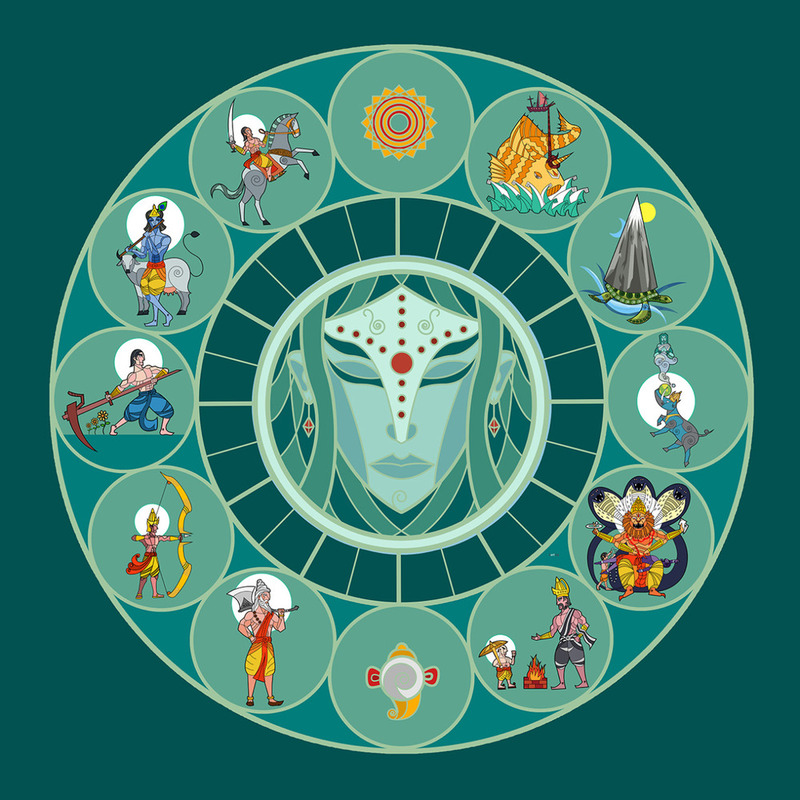 An attempt at putting together the ten avatars of Vishnu in the form of a circular clock, as a loose metaphor for the eternal cycle of time and the universe, and also representing the fact that the duty of all of the avatars was to protect the world, represented as bhooma devi. A postcard illustration of the St.Vitus Cathedral in Prague, from my recent holiday trip there in 2015. A visit inside is well worth the ticket price. The stained glass windows are absolutely gorgeous and the massive flying buttresses outside are simply magnificent to behold. A postcard illustration of the Colosseum in Rome, from my recent holiday to the city of Rome in 2015. It was constructed in 72AD by the Emperor Vespasian and his successor Emperor Titus. It could hold an estimated 50000-80000 spectators. This impressive colossus, despite undergoing a series of restorations, never fails to astound me with it’s sheer presence and absolute magnificence. What’s harder to believe that there’s as much of it still standing, despite being nearly 2000 years old. Nothing else represents the utter descent into an absolutely decadent lifestyle like the Colosseum, as visitors would pour in from all corners of the empire to witness bloody gladiatorial tournaments, animal hunts, public executions, simulated naval battles, re-enactments of famous battles and dramas from classical mythology. 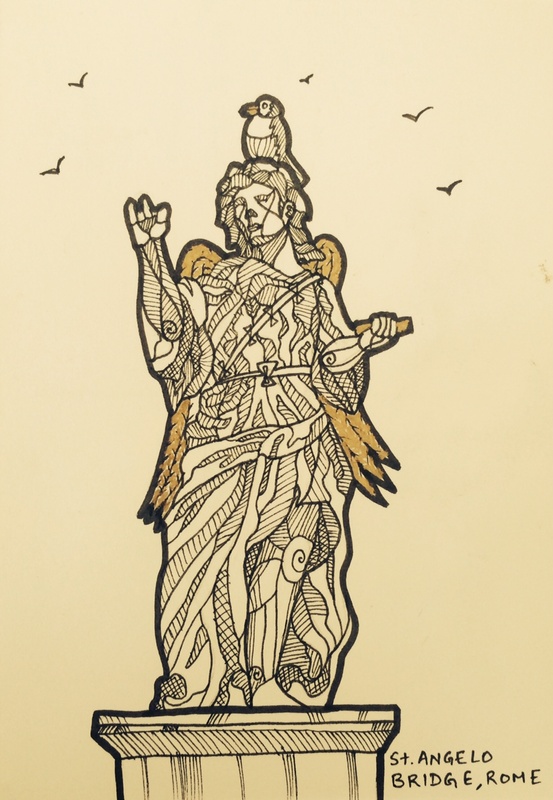 I was inspired by the variety and beauty of the Angels of St. Angelo’s bridge and castel from Rome to draw them as postcards. Here I’ve just used pencils and faber castell black pens of varying thicknesses to ink/shade them. 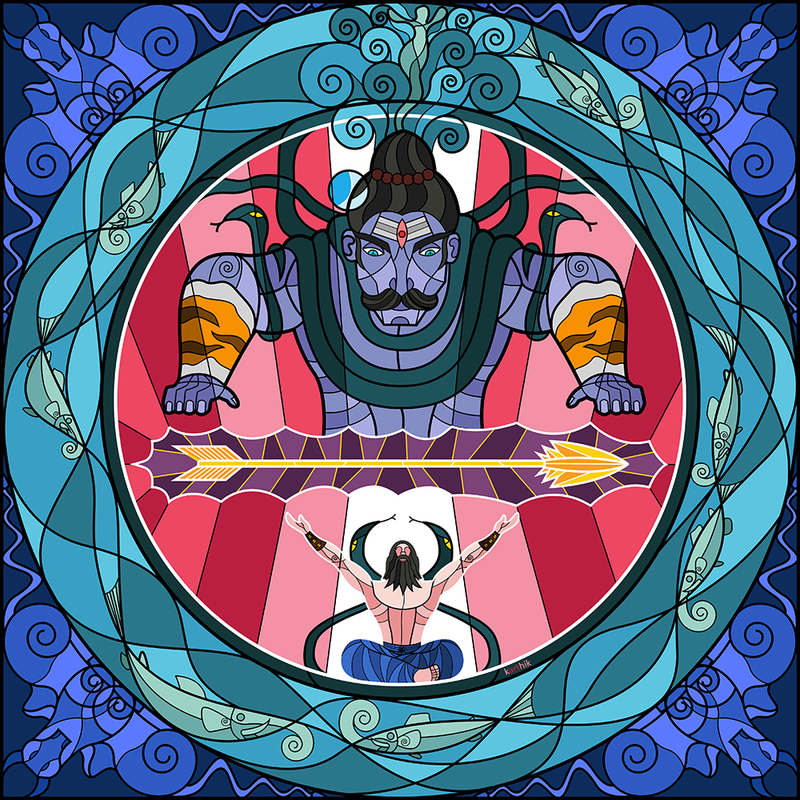 Although he is the primary antagonist of the Ramayana, Ravana is often depicted as having many exemplary qualities. He is the son of the sage Vishrava with the daitya princess Kaikesi, grandson of Pulastya (one of the original saptarishis, who are the mind-born sons of Brahma) and great-grandson of the creator Brahma. He is shown to be a great scholar (having studies the 4 vedas and 6 shastras), a master of the 64 ancient vedic arts, and the creator and master of the Rudra Veena. He is also painted in a slightly sympathetic light, having grown up during the time that the asuras were defeated in battle by the devas, where his mother marries the sage Vishrava just to have powerful children who could challenge the devas and restore the asuras to their previously lost splendor. The story also goes into detail about how Ravana was constantly overshadowed by his older step-brother Kubera and how he would see his mother constantly crying over the pitiable state of the asuras, making him take a vow of vengeance against the devas who put his mother and family in this position. The story goes on to say that to get boons of power, he plucks off his own heads to create a new form of veena and uses his own veins as strings to play devotional songs in praise of Shiva, hoping to win the gods favor. Called Dasagriva/Dasamukha till this point, he then acquired the name Ravana. He is then said to have gone on a roaring conquest, with the symbol of the Veena on his banner, defeating the devas in a decisive battle and dominating both the human and divine races. At the zenith of his power, it was said that he could even command the rising and setting of the sun. According to the story, very few people could defeat him in battle for very peculiar reasons. Upon worshipping Shiva, Ravana had asked for a boon of immortality. When told that this was not possible, he instead asked to be invincible in battle against the devas, gandharvas and wild animals. He didn’t consider humans to be much of a threat and hence did not bother to ask to include them. Rama could defeat and kill him owing to this minor oversight. Certain versions of the story say that Vali, the vanara king of Kishkintha had the boon that he would gain half the strength of any enemy he faced in battle and that he was able to defeat Ravana without even being aware of it. The only other person who had defeated Ravana was Karthaveeryarjuna (the same one who antagonized Parashurama) on the banks of the Narmada river, having himself acquired divine blessings and powers. Since drawing the actual veena with heads and veins would have been a bit gory, I opted for the traditional route of showing the ten-headed Ravana composing songs and ragas on the veena. 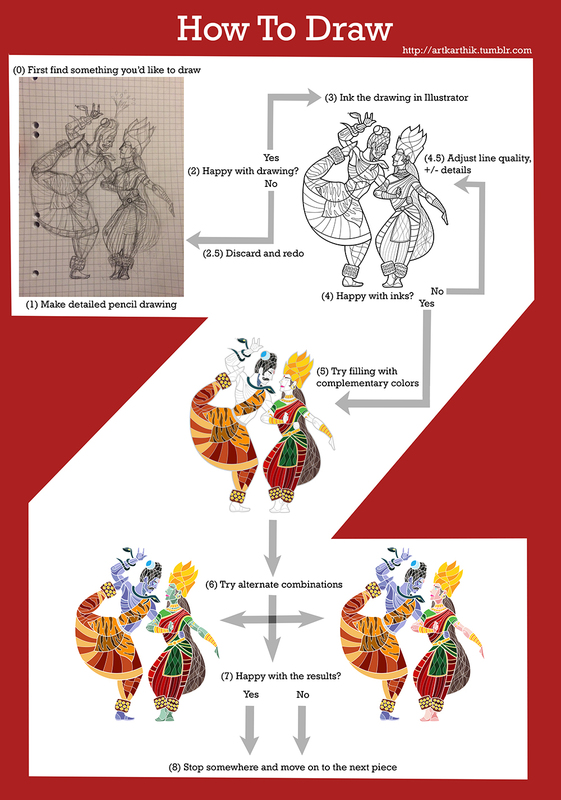 I also thought of alternate ways of showing the ten heads of Ravana (one of his iconic traits), such as stacking them one over the other like bowling pins, or in an abstract pattern, because I really didn’t like the traditional depiction of unbalanced approach of 4 heads on one side and five on the other with one in the middle. I also considered showing each of his faces with a different emotion [such as Kaam (lust), Krodha (anger), Moha (delusion), Lobha (greed), Mada (pride), Maatsarya (envy), Manas (the mind), Buddhi (intellect), Chitta (will) and Ahamkara (ego)], but realized that some of these were too abstract to show visually. 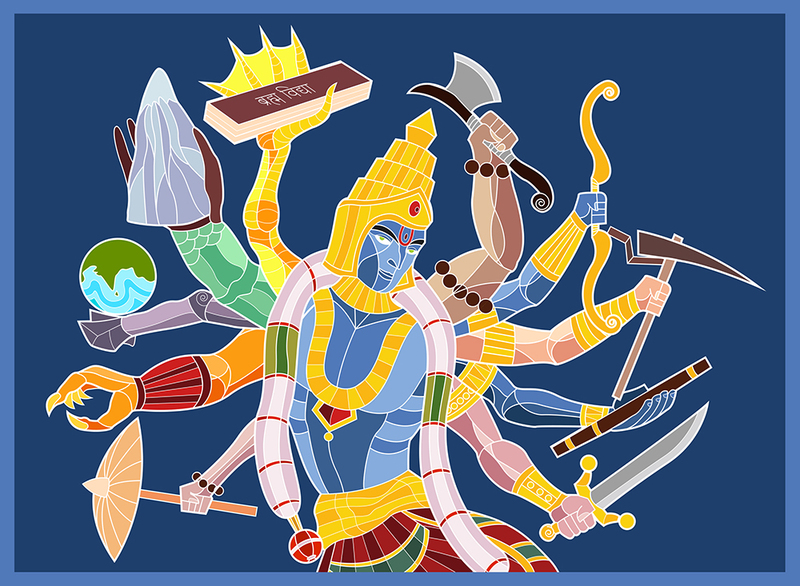 So until I can think of a better way of showing Ravana’s ten heads, he stays in his traditional depiction. The character of Ravana has always been a challenge to draw, due in large part to his many arms and legs which always ends up making him look really awkward. Here’s an attempt at tackling that challenge! Was inspired by my trip to Rome in Italy in June this year to illustrate some of the beautiful sculptures and buildings that I saw there. 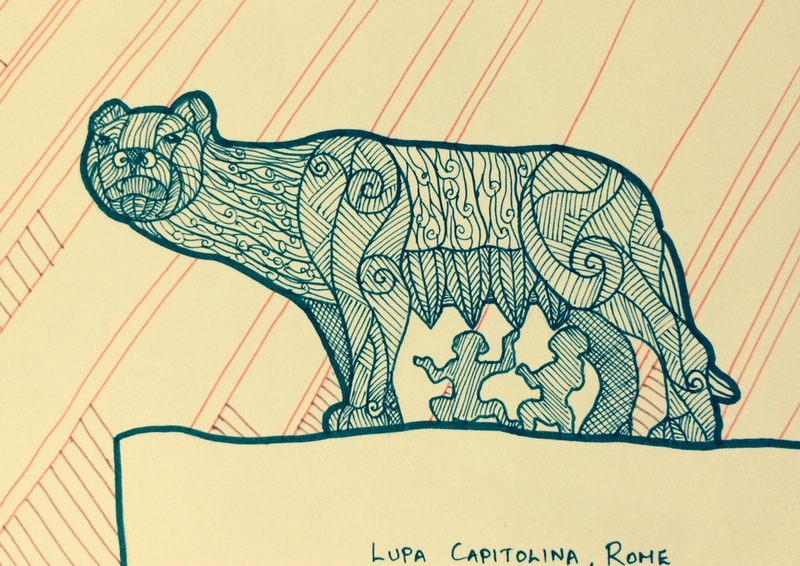 Sources are from Piazza Navona, St.Angelo’s Bridge, Church of St.Louis of the French and the Colosseum. Was inspired by my trip to Prague in the Czech Republic in June this year to illustrate some of the beautiful sculptures, carvings and stained glass images that I saw. Sources are from the Charles Bridge, St.Nicholas Church, St.Vitus Cathedral and a door near the Astronomical Tower. The dance form of Bharatanatyam is as deeply engrained in Indian culture as most of the mythology is, bringing me to this interesting mix of both, where I try to combine Indian mythological characters performing Bharatanatyam steps that are in some way connected with the character’s personality or story. The story of the Vamana is about a dwarf with an umbrella that approaches a powerful demon king and asks for 3 paces of land. The king laughs it off as a trivial request and grants this wish. Unexpectedly, the dwarf grows to a gigantic size and begins his measurement. He raises his foot impossibly high and with the first step, he covers the distance between the Earth and the Heavens. With the second step, he covers the distance between the Heavens and the Netherworld. He then raises his foot one more time, asking the king where he can measure his third pace of land. The king realizes that this is no ordinary dwarf and understands that this is an avatar of Vishnu, come to test him. Humbled and rid of his former pride and arrogance, he submits entirely and offers his own head in exchange for the promised third pace of land. The Indian festival of Onam, celebrated in the state of Kerala, marks the commemoration of the Vamana Avatar of Vishnu and the subsequent homecoming of the mythical King Mahabali. When looking for reference, I found this spectacular image of a Bharatanatyam dancer raising one foot to the heavens, instantly making me think of this story. An addition I made was to place an umbrella in his right hand, which is often symbolically connected with this character. So, what do you think? Gives a whole new meaning to the phrase, “Give them an inch and they take a mile,” doesn’t it? This inspired me to create a Make-it-yourself style box toy of Brahma that anyone could assemble and make for themselves. Hope you have fun making it! The 36th Chamber of Shaolin is a bit of an odd movie for me in that my parents had narrated the entire story to me many times before I actually got around to actually watch the movie myself. My dad loved watching the intense training sessions that came along with learning martial arts. My mom loved the entertaining scenes where the hero fails comically, learns a valuable lesson and then succeeds. When at last I managed to find a good print of it, we immediately put away all other distractions and watched it together. Since then, I have watched this movie multiple times and it remains to this day my favorite Kung-fu movie for its realistic portrayal of martial arts training, depiction of the journey of personal transformation and how one man’s desire to change the world can influence his path. It was of course natural that I pay tribute to this movie with Ganesha in the iconic pose where the hero unveils his newly crafted Sanchaku or 3-part fighting sticks connected with chains. I also tried to arrange the text similar to how it appears in the movie’s posters. And there you have it! Hope you like it!